This week there were scheduling conflicts and illness. At the start of the session we had the Judge (me) and a player (Erich). In the last session, Erich’s elf Quinlyn died. I also realized that I had not given him the opportunity to bond with a patron (they had a week), nor did he have an extra spell for his high intelligence. With everyone new to the game, I wanted to correct this. We did a bit of retroactive play. 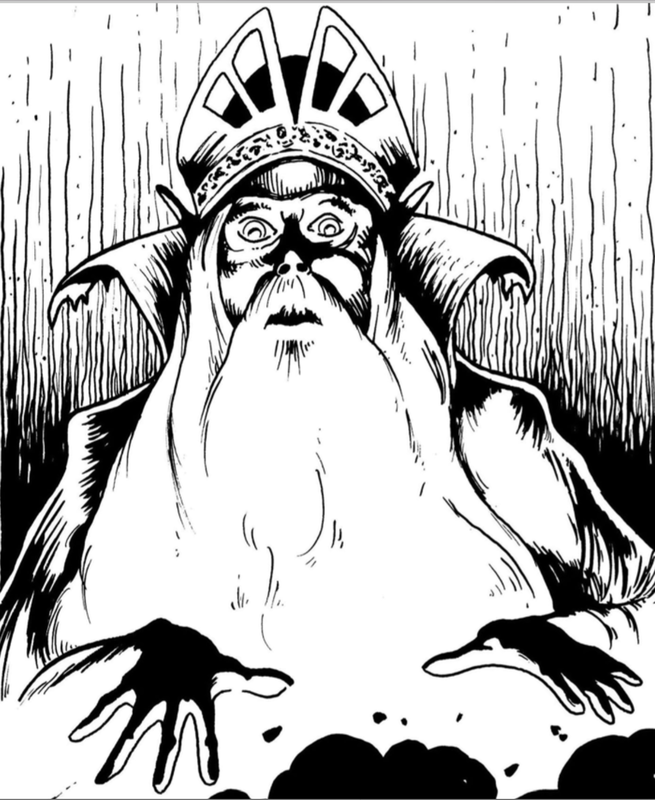 Erich bonded with the King of Elfland, sacrificing an emerald for a +1, taking minor corruption for a +2, and spell burning for 2. Quinlyn gained infravision as his minor corruption. He also chose Woodland Stride as his spell. From there, we played through his death. As Quinlyn’s body expired, the King of Elfland whisked him away to convalesce in Elfland (for a week), but at cost. Prior the session, I whipped up the following table of demands for the King of Elfland. Table 1: What does the King of Elfland require of you? What does the King of Elfland require of you? 1 The hound must die, but you must capture its soul. He gives you a net made of individual blonde elf hair. As you slay the hound, cast the net over it. Then bring the net to the wooded grove. 2 He has seen the strands of your fate. He wants you to bond 1d3+1 to him by the next full moon. 3 The Devil's Tithe is soon due. For the cost of restoring you, I need two human souls in payment. 4 There is a wife of a devil in this village. Bring her, alive, to the wooded grove. 5 Nearby, an emerald enchanter is leeching power from Elfland. You must stop him. 6 There is a wizard not of your world. He is still weakened from his recent captivity. He is traveling and exploring nearby. His patron is the foul Bobugbubilz. Dispatch the wizard. 7 The drinking horn was a gift to a long dead friend. I wish it returned to me, so I may honor his memory. 8 The standing stones near Hirot have bound the surrounding lands to Chaos. You must unbind them. 9,10 Roll 1d8 twice on the chart. He rolled a 1; With soul net in hand, the King whisked Quinlyn back. No other players arrived, so we took a brief intermission and played Boggle with another game night attendee. After 45 minutes of fun, and a serious drubbing, two other players arrived. Thomas from the prior week; who’s surviving character “Snips” was also captured. They each rolled up 4 new 0th level characters for them, and we got started. In the previous session, Iraco the Hunts Master and his goons captured the adventurers. In the confusion and dim light, they missed Ralph. Seeing Iraco and the hunters heading out, the 8 characters waited and followed a bit later. They heard the calls of Lloré (“The sun sets. Come out.” a long pause “You promised! The sun sets, it’s time to free Morgan.”). They waited. They hear the Iraco’s ambush sprung (“Bind them and take the to Hirot.”) They wait several minutes and head to the mound. There they see Quinlyn, the elf, tending to Ralph. Quinlyn attempts to heal Ralph through by casting Sleep. He fumbles, and demon claws grow from his fingers. Spellburning, Quinlyn regains and casts sleep; healing Ralph for 5 hit points. The villagers, tired of Iraco and the Jarls inaction want to help the heroes. They plan to sneak into Hirot to free their friends and get their gear. At the palisade, Arrick strikes up a conversation with Naven (a night watchman). On Quinlyn’s signal, Naven will create a diversion - yelling something about an elf and halfling over the wall. Ralph, the halfling, sneaks through the dim streets of Hirot; The adventurers back several stone throws. Ralph sees the building, two guards at one door, another door barricaded with one guard on watch. He sneaks to the side window, peers in and sees his companions, beaten and bruised. Two guards are inside drowsing. Naven creates the distraction on the wall, the two guards in the house come out. They go to the wall. The other guard heads out in the opposite direction. Arrick approaches and strikes up a conversation with Nori. Quinlyn arrives and casts Charm Person; Nori and Quinlyn are best buddies! Quinlyn casts Sleep on Nori (with the primary goal of healing the captives). Nori saves and Quinlyn heals the captives. Iraco must’ve poisoned the thief and dwarf as they do not awake. I don’t have their character sheets so I leave them there, in a drugged state. As they approach the the south gates, they see light from the great hall on motte. In the doorway stands the Jarl, his Thegns, and Sylle Ru. A quick decision, Ralph and the villagers will remain inside the palisade. Quinlyn, Eustic, Odin, Lloré, and “Snips” will head out to the standing stones. But, they’d need a distraction. Ralph scampers up a ladder, throws some oil onto the burning brazier, splashing it on the palisade! How about a little fire. The Jarl and crew working their way from the motte into the bailey, let out a cry of fire! The hound, in its malignant evil approaches the altar, arrogant in its looming feast. The adventures ambush the hound. Eustace fires a magic missile. Quinlyn burns the hound with flaming hands (with Ralph burning another point of luck). Three villagers charge, one of them hitting, as Odin follows to deliver the killing blow with the wolf spear. Odin, declares a Might Deed to Trip the Hound of Hirot. The roll…3 on the d3 and 20 on the d20. Odin pins the hound, breaking it’s leg, as he delivers the killing blow. Quinlyn takes the soul net and casts it over the hound. The blonde hair turns crimson as it works its magic. We draw to a close, parts of Hirot burning. 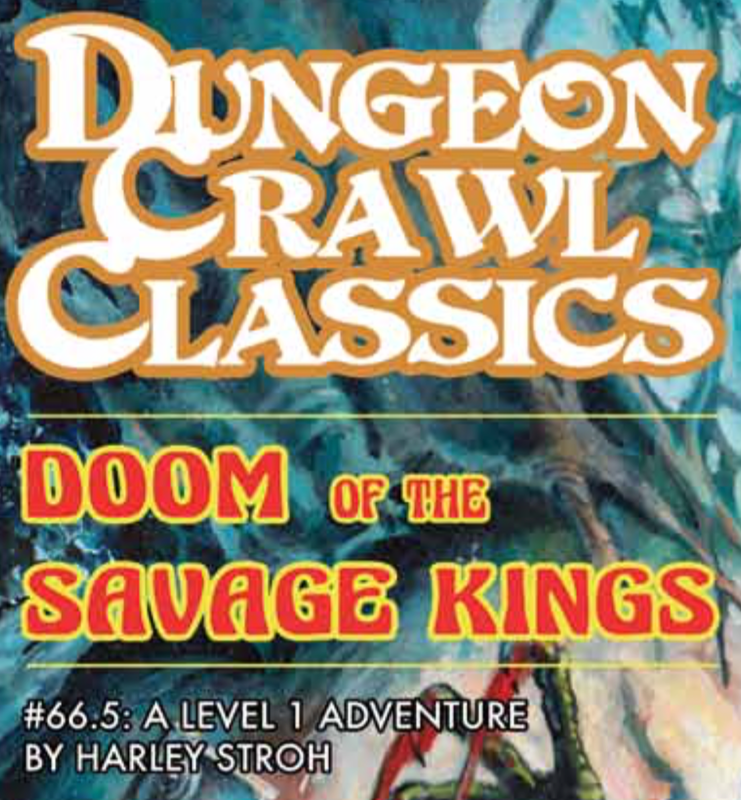 Dungeon Crawl Classics - A Deal is Made [Session #3] by Jeremy Friesen is licensed under a Creative Commons Attribution-NonCommercial-NoDerivatives 4.0 International License. Based on a work at https://takeonrules.com/2017/03/17/dungeon-crawl-classics-a-deal-is-made/. Permissions beyond the scope of this license may be available at https://takeonrules.com/more_permissions/.